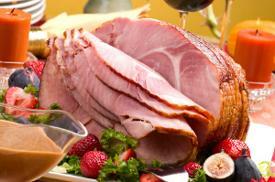 Ham is a staple Easter party food. Easter party food ideas will depend on a number of factors, including the time of day the party is scheduled for and the number of guests attending. No matter which type of party you're planning for, there are plenty of options for terrific fare to offer your guests. With the help of these suggestions and your own resources, coming up with food ideas for your Easter party can be a breeze. Don't forget to consider options for beverages, both alcoholic and non-alcoholic, including coffee and tea for guests who enjoy them. With careful planning, you'll be able to relax and enjoy your Easter party with friends and family.